In the late 2000's, my nonprofit wrote a grant in response to a Request for Proposal (RFP) by our state human services agency to provide mentoring services to at risk youth for the purposes of juvenile delinquency prevention. Youth eligible for the program were selected based on criteria that determined their at risk status. For 4 years we provided these services to hundreds of children in South Texas, and thousands across the state. 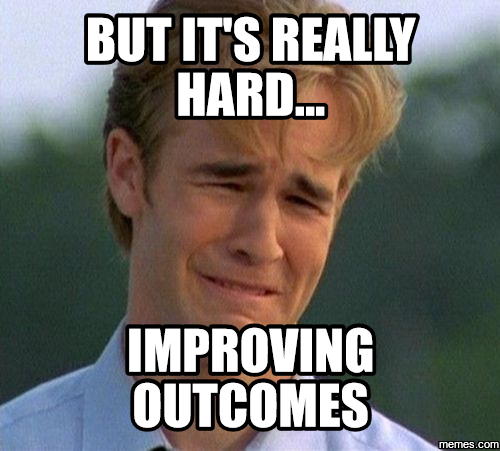 We had amazing outcomes: 98% of youth served statewide stayed out of the juvenile justice system. "Did you take the outcomes into account?" I asked. "No," they replied. "That has nothing to do with the creation of the new RFP." I was speechless. I have a hazy, surreal memory of them describing the research the PHD they had hired to write the RFP had been doing on evidence based parenting programming that informed the new approaches they wanted to try out. That was a low point in my nonprofit career. I felt helpless and hopeless. I came closer to quitting than at any other time I had had to deal with this kind of self defeating situation (which actually happens all the time in the nonprofit world, unfortunately). So, I read some books, sought out mentors, and signed up to chair the Advocacy Committee for The Nonprofit Council. The nonprofit sector struggles to identify, define, demonstrate, measure and prove outcomes. For such great success to be so summarily dismissed was heart-rending. In the for-profit world it's so much easier. The more money you make, the more successful you are. The more demand for your products and services, the more you grow. Demand for nonprofit services may very well be an indication of success but by no means determines growth or impact. A lot of the time it makes us less successful as we try to stretch already stretched revenue to do more. 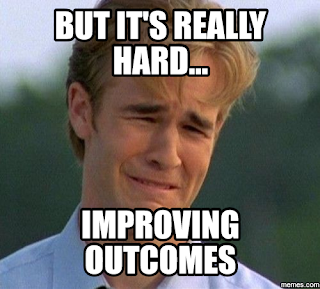 I hear more than ever now about how we need to improve outcomes, and it always makes me think of that RFP. No one cared about the outcomes in that situation and it became a microcosmic illustration of the problem for me. It was particularly frustrating because there didn't really seem to be any real solution on the horizon. And then I heard about Pay For Success: an innovative approach for addressing persistent social problems. I am so excited about this program. I first heard about it related to a program in the UK that aimed to reduce recidivism - keeping people from re-offending and going back to prison after they had served time and supposedly been rehabilitated. An enormous amount of money is spent on rehabilitation and yet recidivism remains alarmingly high. The Pay For Success concept is to invest only in proven effective approaches and programs and only pay for success. If your program doesn't do what you said it would, you don't get reimbursed. I am reminded of my favorite saying: "Don't confuse activity with achievement." The nonprofit sector is filled with well meaning people running around doing things. It has only been important to "do good work" regardless of outcomes. 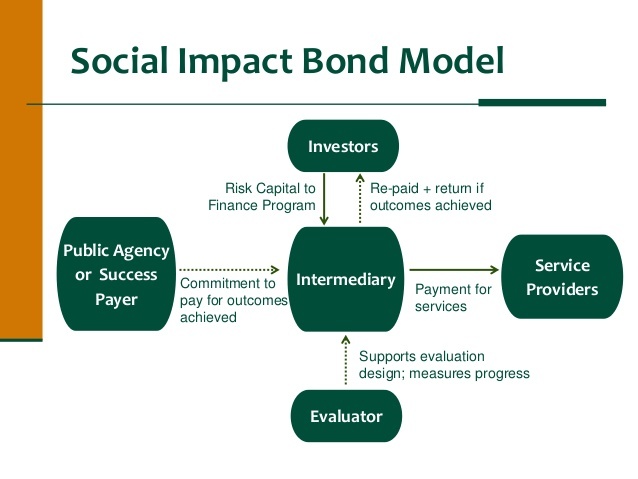 The funder invests in the organizations with the most effective models. The organizations with the most effective models implement their programs and services, with results. The government pays the funder back with revenue that was saved as a result of effective programs. A real world example is of the Friends of the Children (FOC) Program that is attempting to interrupt the cycle of generational poverty. One of the ways they are doing this, for example, is to reduce the number of days that a child spends in foster care, thus reducing the cost of foster care. The savings can be put back into the FOC programming for additional outcomes, and additional savings. This is scary for a lot of people. As you can imagine, it's a hard sell to ask organizations to spend money and risk not getting reimbursed for it. This post is a really simple explanation for a very complex program, but that's the gist of if. We cant' afford to spend billion of dollars every year in the social sector and not solve any problems. Pay for Success is the wave of the future and I for one am thrilled! You can read more about the pay of pay for success here. I'll be writing more about this in 2017 since the annual Issue in Profile event put on by the Nonprofit Council in October will feature a keynote on this topic. Stay tuned. *I was also very pissed off.